The Training Committee will (i) identify CONP training opportunities, (ii) oversee training and visiting scientist stipend awards, (iii) monitor the training experience and, (iv) foster international training opportunities. The committee will coordinate the embedding of trainees within the scientific milieu of individual CONP sites. Senior software engineers and CONP scientists, engaged in CBRAIN (Glatard), LORIS (Das), Brain-CODE (Strother), MEDICS (Duchesne) development will be responsible for the development of the CONP cyberinfrastructure. The Ethics and Governance Committee will work to facilitate the sharing of rich imaging, genomic, clinical and phenotypic datasets in a manner that: respects the privacy and expectations of participants; complies with regulatory requirements; and aligns with international best practices for open science data governance. 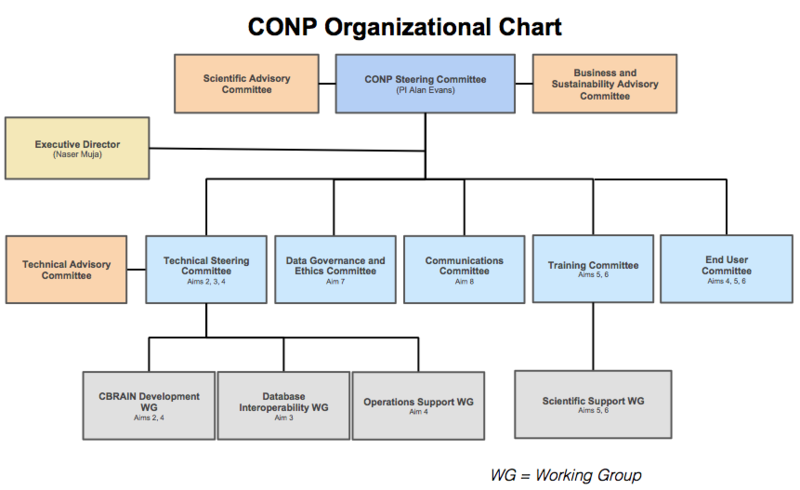 The End User Committee will work with the CONP Steering Committee and all of the CONP working committees to guide CONP priorities and to facilitate data exchange activities. The End User Committee will be a bidirectional vehicle for best practices and data dissemination (main stakeholders reached: health care professional societies, public health authorities, policy makers). The CONP Communications Committee will support the development of an open environment for scientific discourse such that research objects are supplemented with multimedia content including interviews, videos, and editorials. Diverse content will be distributed via a publishing platform that enables data curation, data and code accessibility, and technical reproducibility.